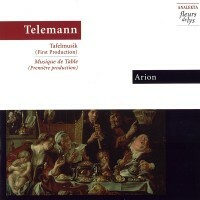 Telemann was an imaginative and highly prolific composer and is definitely among Arion’s favourites. This recording is the perfect occasion to hear some of his concertos for various combinations of woodwinds and string instruments, with a common point of always having either a baroque flute or recorder as one solo instrument. *** Nominated for a Felix Award *** (ADISQ, Canada)Beautiful and impressive playing like this sets the standards to which others must aspire! 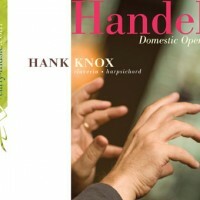 – Early Music Review (United Kingdom). The musicians of Arion started playing together in 1981. 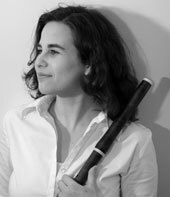 Flautist Claire Guimond has been the artistic director of the Ensemble since its inception. From the outset, Arion’s concerts were unanimously hailed for their clarity and gusto as well as their refined and expressive performances of a vast array of carefully-chosen early music works. An unrelenting attention to detail has made Arion’s artistic achievements worthy of those of the greatest current early music ensembles in Canada. The group calls upon world-renowned guest conductors to perform vocal and instrumental works in its high-profile series of concerts in Montreal. A recipient of numerous awards and grants, Arion has toured extensively throughout Canada, Europe, Mexico and the United States. Recent years have brought the musicians to the Canadian Prairies, Europe (with a performance at the prestigious SouthBank Centre in London), the Canadian Maritimes and the east coast of the United States. 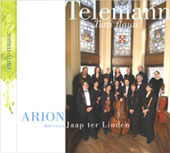 Arion’s discography features 22 CDs, distributed internationally both as a quartet and in a larger setting with the collaboration of such fine artists as recorder player Marion Verbruggen, sopranos Agnès Mellon and Suzie LeBlanc, countertenors Matthew White and Daniel Taylor, baritone Max van Egmond, violinist and conductor Monica Huggett, Barthold Kuijken and Jaap ter Linden. 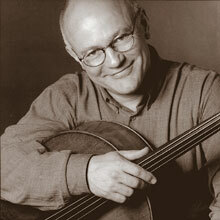 The cellist and gambist Jaap ter Linden is one of Europe’s most prominent interpreters of baroque music. As one of the first specialists in this field he actively participated in the foundation of many baroque ensembles which now play an important role in our musical life. He was co-founder of the ensemble Musica da Camera and principal cellist of Musica Antiqua Köln, The English Concert and The Amsterdam Baroque Orchestra. He is now regular conductor of The Mozart Academy. Jaap ter Linden has acquired great fame as performer in solo and chamber music repertroire. As chamber musician ter Linden regularly performs with pianist Ronald Brautigam, violinists Andrew Manze and John Holoway and cembalists Richard Egarr and Lars Ulrik Mortensen. He recently founded a new Pian Trio together with violinist Elizabeth Wallfisch and pianist Ranald Brautigam. Ter Linden is also increasing in demand as conductor of both specialised and “modern’ orchestras. In 2000, he founded the Amsterdam Mozart Academy, dedicated to performance and recording of classical repertoire. This classical style, from all over Europe. 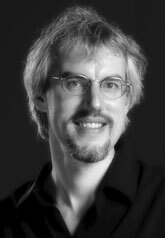 Ter Linden was guest director with the Deutsche Kammerphilharmonie, Portland Baroque Orchestra, Beethoven Akademie, The European Union Baroque Orchestra, Amsterdam Bachsoloists, Amsterdam Nieuw Sinfonietta and San Francisco Philharmonia Baroque. He has worked with sooists like Andreas Staier, Ronald Brautigam, Richard Egarr, Julian Rachlin, Paulin Oostenrijk, Suzie LeBlanc and Emma Kirkby. In recent tours ter Linden has directed Arion, a Mozart programme with the Arnhem Symphony Orchestra and a major tour with his own Mozart Academy. Ter Linden has recorded numerous cd’s with these ensembles and with chamber musicians like Andrew Manze, Richard Egarr, René Jacobs, Ton Koopman, Reinhardt Goebel, John Holloway and Lars Ulrik Mortensen. His recent recording of the Bach solo suites with Harmonia Mundi usa was unanimously acclaimed. With Manze and Egarr, he recently recorded the Violin Sonatas from Rebel and Bach (both recordings awarded the Preis der Deutschen Schallplattenkritik). His recording of Bach’s Gamba Sonatas was “Editors Choice” of Gramophone. He also recorded the Oboe concertos from J.S. 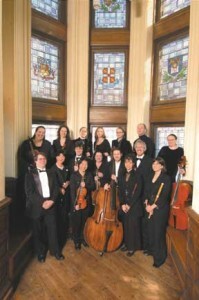 Bach and sons with Pauline Oostenrijk and Nieuw Sinfonietta Amsterdam, which was nominated for the Edison Prize. With the Amsterdam Mozart Academy he has recorded all Mozart symphonies. Matthias Maute was born in Germany in 1963. He has achieved international recognition as a recorder player, flautist and composer. In 1990, he participated in the prestigious Ancient Music Competition in Bruges, Belgium, where he won First Prize in the soloist category. Following this success, he decided to devote all his creative energy to the Ensemble Caprice and to develop its highly original style, enhanced by his own arrangements and compositions. He also regularly tours as a recorder and flute soloist in Europe and the United States with the New York Rebel Ensemble. In June 2003, he was invited to play at the Boston Early Music Festival. In addition to his work in chamber music, Matthias Maute is the first flautist of the Baroque Trinity Consort Orchestra in Portland (Oregon), conducted by Eric Milnes, and also plays with the Rebel Baroque Orchestra in New York conducted by Owen Burdick. He teaches at McGill University in Montreal. Mr.Maute is the author of a book on improvisation which will be published by Breitkopf & Härtel in spring 2004. 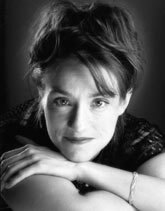 Sophie Larivière has played with the Ensemble Caprice since 1997 and is its artistic co-director. In addition to touring with the ensemble, she has participated in the International Recorder Symposium in Stuttgart, the Recorder Series in Germany in Schwelm, and the Recorder Festival of Stockstadt in Germany. She has also been a guest performer with several early music ensembles including Arion (Montreal), Les Idées heureuses (Montreal), Les Violons du Roy (Quebec), Rebel Ensemble (New York), the Studio de musique ancienne de Montréal and the Theatre of Early Music. With this ensemble she has performed at the Vancouver Early Music Festival. 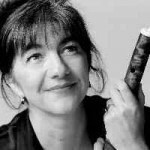 Claire Guimond has established herself as a leading baroque flautist, first in Canada and more recently on the world scene. She is based in London and Montreal. She is a founding member and artistic director of the Ensemble Arion, a baroque orchestra with whom she has frequently toured North and South America and Europe. She performs regularly with Tafelmusik, features in radio and TV broadcasts and plays at many festivals in Europe and North America, performing under such distinguished conductors as Ton Koopman, Andrew Parrot, Jordi Savall, Nicholas Mcgegan, Philippe Herreweghe and Bruno Weil. More recently she has been broadening her range with solo recordings, an extended ensemble, playing with other world class baroque musicians such as Monica Huggett, Suzie Leblanc, Maggie Cole and many more. Her recordings with several labels are distributed world wide and have been praised by the international musical press. Her version of the sonatas by Joseph Bodin de Boismortier, with harpsichordist Luc Beauséjour, earned a 10/10 in the French Magazine ‘Repertoire’. The same magazine has rated her solo recording of Telemann’s Fantasias as one of the two definitive versions. Claire Guimond made her London Debut at the renowned Wigmore Hall in 1998 and now performs regularly in the UK. See Claire’s ‘Upcoming Concerts’ for her current programme. 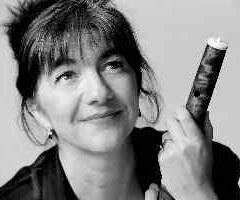 In September 2000, Claire was appointed Artistic Director of the Lamèque International Music Festival in New Brunswick, Canada. Born in Montreal, Mika Putterman was introduced to the traverso in her second year of CEGEP where she was studying the modern flute. Mika then studied with baroque flutist Claire Guimond, while completing her music degree at McGill University. After receiving her Bachelor’s degree with honours in early music performance and literature, she was accepted at the Conservatoire National Supérieur de Musique de Paris and moved to France. In 1997, she attended the Koninklijk Conservatorium of Brussels where she studied with Barthold Kuijken and Marc Hantaï. She graduated with high distinction in June 2001. Mika produces a series in Montreal called Autour de la flûte which features the wooden flute from the baroque era to the romantic era. She also performs regularly in both Canada and Europe and is invited to play regularly with the Arion Ensemble (Montreal), Tafelmusik (Toronto), Il Fondamento (Belgium), Ensemble XVIII-21 (France), Les Menus Plaisirs du Roy (France). She has played with members of La Petite Bande and has had the privilege of working with such conductors as Paul Dombrecht, Manfredo Kraemer, Barthold Kuijken, Jeanne Lamon, Jaap Ter Linden, Hervé Niquet, Dominique Visse and Julian Wachner. She has recorded several concerts for both CBC and Radio-Canada. In 1996, Mika was the winner of the National Flute Association Baroque Flute Masterclass competition and in 2003 was selected to perform for both the Munich baroque competition and the Historical wind competition in Antwerp. 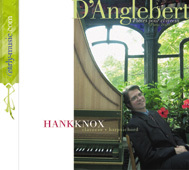 Recorded 29 and 30 November, and 1st December 2004 at Saint-Augustin-de-Mirabel Church, Québec.